Last week was the biggest Frugal Friday linky party to date with over 400 posts! That's a lot of inspiration!! I found great posts by the bucketful. First up, Moms by Heart shared some free Valentine's printables. 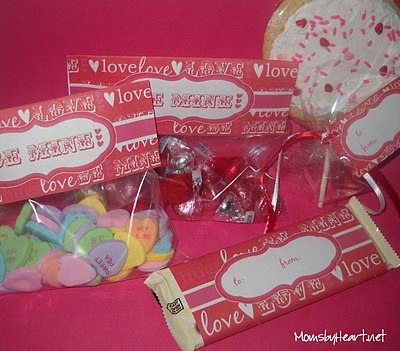 Still in need of unique Valentine's for your kids' class? Check out these ideas. Modern Country Style shared her Wedding Cushion...I just love how they call pillows cushions in England, don't you? Wonderful idea to show your significant other what they mean to you! 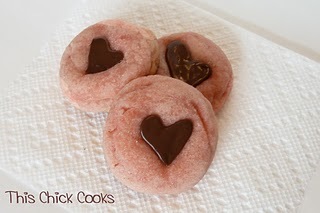 I LOVE sugar cookies...and these pink cookies with chocolate on top...oh yeah! Find them at This Chick Cooks. 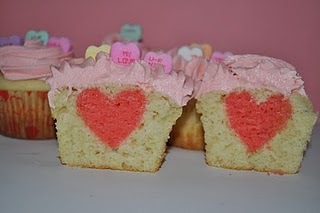 At Alison's Wonder Scraporium you can learn how to make these ADORABLE heart-filled cupcakes. Too. Cute. For. Words. Seriously. Finally, the non-Valentine's-y post I HAD to share. You probably all know by now that I have a soft spot in my little designer heart for nurseries and children's rooms. So I absolutely love this nursery shared by Lunden Lou. So pretty. 1.Please link directly to your post, not just to your blog. 2.Please link back to The Shabby Nest...share the frugal goodness. I reserve the right to remove any posts that are not in keeping with the spirit of Frugal Friday including but not limited to, those that link to your shop, those that link to your giveaway, those that to your linky party. Let's all play fair m'kay? Thanks for hosting! Always love the links in this blog party. Thank you so much for hosting! I posted #22 the Dress up Center - I made it out of my girls baby armoire. thanks for hosting- even with all the stresses you have right now, you still throw a good party! WOW! You featured My Girl's nursery! I am flattered!!! Love you blog and your ideas! Keep up the great blogging and decorating! Seriously hope your weekend perks up... look for the daffodils under all that snow! Thank you for hosting! Take care. Thanks for hosting! That nursery (and the story behind it) is amazing! 400! Holy Crap! the nursery..WOW. Wow!!!! I am in LOVE with that nursery! I thought I had decided what I was going to do for mine but now I am having second thoughts - ahhhh!!!! This is my first time linking up to Frugal Friday. It took me a few minutes but I just got links back to you added to my posts! Hope you have a fabulous weekend, Wendy! Ooooh, that's my cushion!! Thank you for picking it out. Thanks for hosting and featuring my cookies :) Have a wonderful weekend. Thanks for hosting. THis is my first time here, and joining in. What a gorgeous blog you have. Wow - thanks for featuring my free printable! I'm linking a little table transformation I did this week. "Frugal" is a good description for it, for I spent NO money on it whatsoever! I just love it when that happens. Thank you for being such a gracious hostess! since I just LOVE your blog...I have given you the "stylish Blog" award. You can pick it up along with the instructions on my blog : ) Check it out if you have some extra time. I'm a new follower and just linked up. Thank you for hosting! I look forward to following your blog!